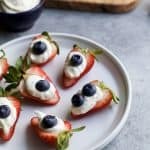 Patriotic Cheesecake Stuffed Strawberries – an easy healthy recipe that tastes like strawberry cheesecake but without all the calories! In a small bowl add greek yogurt, cream cheese, honey, vanilla bean paste, and lemon zest. Using a hand mixer, blend until the mixture is smooth (like cheesecake) and there are no lumps. Add cream cheese mixture to a ziplock bag, close it, and then snip off the end to create a make shift pipping bag. Squeeze about 1 tablespoon of the cream cheese mixture on each strawberry half. Top with a blueberry.